(left to right) Elbert Isaac Hennesy, June 27 1897 – March 12 1967; Curtis Moore Hennesy, January 28 1903 – Feb. 1973; Clarence C. Hennesy, January 6 1894 – April 8 1960; Jewel Hennesy; E. E. Hennesy, June 1 1903 – November 24 1992. What an impressive array of hats! Jewel and Curtis especially wear theirs well with near Hollywood Cagney appeal. A mob of Irish Hennesies. 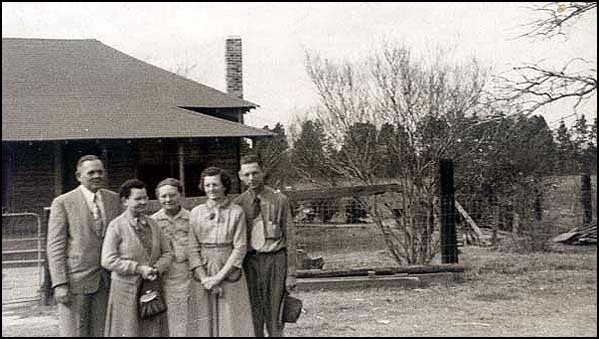 Curt, a son of Elbert Isaac Hennesy, identified the 3 left men. Jack and Jean Kearns identified Esmond and Jewel. 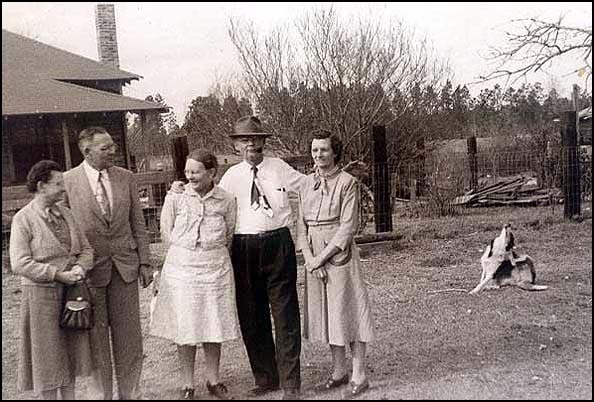 Clarence and Elbert were sons of Marion Isaac Hennesy and Fanny Samantha Crow. Curtis was son of Marion Isaac Hennesy and Maude Edith Corkern. Marion Isaac Hennesy was James Leon Hennesy’s brother and an uncle to Esmond. I herewith enclose prints of the snapshots which I think you’ll be interested in having. Sorry they are no better, but you realize the material was not too good for photographing. I am still enjoying the thoughts of our little get together, and hope we can do it again before too many years. Have not heard from Clarence since he left here. I believe he was on his way home during that freeze. Give my regards to the family. P.S. Clarence arrived home safely. The men, left to right, are Elbert Isaac Hennesy, June 27 1897 – March 12 1967; and Clarence C. Hennesy, January 6 1894 – April 8, 1960. The women are as yet unidentified. Clarence and Elbert were brothers, sons of Marion Isaac Hennesy and Fanny Samantha Crow. I love the dog in the background scratching away. Left is Elbert Isaac Hennesy, June 27 1897 – March 12 1967. 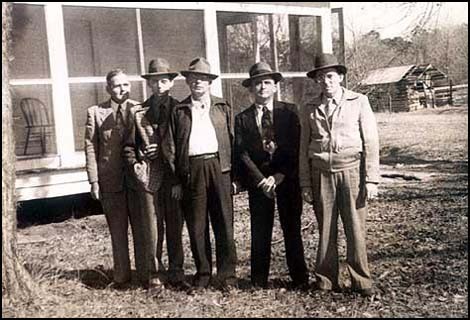 Right is Curtis Moore Hennesy, January 28 1903 – Feb. 1973 Others are unidentified as yet. Photo 1951. Elbert and Curtis were half-brothers. Elbert was a son of Marion Isaac Hennesy and Samantha Crow. Curtis was a son of Marion Isaac Hennesy and Maude Edith Corkern.